The importance of your customers’ experience with your business, when building a successful brand, shouldn’t be underestimated. The customer experience has always been important but it is even more important today when consumers can easily share online their good and bad experiences with those they know, and those they don’t know. A well-designed logo, a catchy tagline or slogan, a nicely put together business card and marketing brochure, a well laid out and attractive website, and branded social networking profiles that are complete, are all important parts of building your business brand. The words and images or outward appearance that represent your brand in your marketing and advertising, help give a personality and a face to your business for consumers. The quality, consistency and brand recognizability of these various print and online tools are the lures (think fishing) that help attract consumers, prospective customers who may know little about you, to consider doing business with you. The easier your brand is to identify consistently with a quick look, the more likely it is that repeated exposure to that look will cause consumers to remember you, to feel like they know you. When it comes time for a consumer to decide whether they will deal with you or someone else, name brand recognition becomes an important factor. If consumers think or feel positive about your brand, this is helpful for your business. If they feel negative about your brand, this can hurt your business. If your website is dated and not mobile-friendly, if your social media profiles are incomplete and inactive, if your marketing materials are poorly put together; all of this says something to consumers about your business. What they experience (think and feel) when they check you out online, see your advertisements online or in print, or receive one of your marketing pieces factors into whether they give you a chance to earn their business, or not. The key to your success, however, is not your name or your logo. World famous brands like Nike, Apple, McDonalds and Coca Cola didn’t become successful because they have amazing logos, tag lines or names. In fact, there’s nothing that spectacular about any of their logos – but we all recognize them! They became famous for a number of reasons, but the core their success is based on consumer trust. Consumer trust boils down to taking care of your customers and delivering on your brand promises. Their branding and marketing materials, and the quality of them, told consumers who they were and what they had to offer. Delivering the promised customer experience (products, services, customer service), built the relationship. Marketing plays an important part in creating awareness of your business or brand, and in continuing to build and maintain any brand awareness gained. 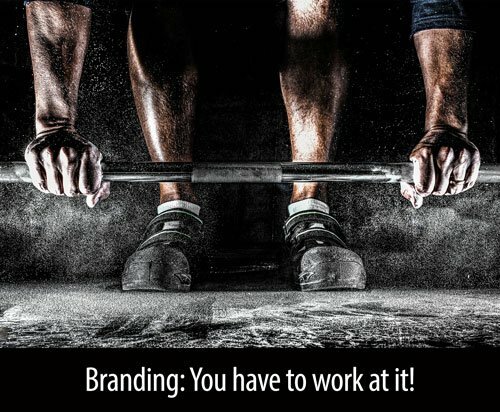 For your branding to really work for you, it needs to present your business professionally (however that looks in your particular market.) It then needs to be backed up by your reputation in the marketplace. Your reputation will come from how your products and services, and your customer service, are experienced by consumers. Do consumers see their experience with your business as having genuine value, based on your brand’s promises? Having great looking marketing materials can lure or attract consumers to take a closer look at your products and services. It may even entice them to do business with you. But it won’t keep them coming back if what is on the inside of your business (your products, your services, your customer service) doesn’t measure up to your promises and their expectations. For your brand to have an impact in your local area and beyond, these four areas need to be in alignment. “A tone of voice is an expression of a company’s values and way of thinking. It cannot be plucked from thin air, created on a whim or entirely based on a trend you think is cool. Rather, it must grow out of who you already are as a company. Consumers are a powerful force in today’s online world. These areas make up the personality of your brand and together they help determine what people think and feel about your business. They influence your reputation and, as a result, consumer buying decisions. Ultimately, a professionally designed logo, tagline, website and marketing materials, are the icing on the cake when it comes to building your business. It’s the part that attracts us (consumers), gets our mouth watering and anticipating what taking a bite of the cake – doing business with you – will be like. The real substance of your brand is the customer experience: a combination of the products, services and customer service delivered by your business. You need the various pieces working together (the marketing experience and the customer experience) to attract consumers to become customers and to retain them. Building a strong brand that resonates with and has influence with your target audience doesn’t happen overnight. But, when the products, services and customer service you deliver live up to and exceed your brand promises and customer expectations, the power of word-of-mouth advertising comes into play. And, in a digital world, positive word-of-mouth advertising is critical for any business hoping to attract new customers and retain existing ones.